Kaal Bhairav Temple is situated in Varanasi.Varanasi is Picturesquely situated on the crescent shaped left bank of the holy Ganga, Varanasi, one of the ancient seats of learning in India, is said to be a compound of the names of two streams, the Varuna and the Assi, which still flow in the north and south of the city respectively. This name seems to have been corrupted, in medieval times to Banaras, which was in use till May 24, 1956 when it was changed to Varanasi, by an order of the Government of India. Varanasi is probably one of the most ancient living cities in India. From time immemorial it has been a great religious center for Hindus and one of their most sacred places of pilgrimage , being visited by millions of people every year. Situated in Visheswarganj, Kaal Bhairav, is a temple dedicated to Lord Shiva. There are nine other Bhairav temples in the city. 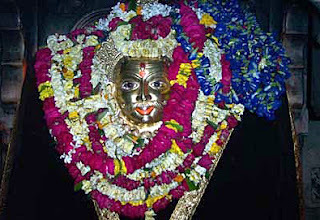 Kaal Bhairav, the "Black Terror," is widely known as the Kotwal, the "police chief," of Kashi, and the section of the city in which his temple stands is known as Kotwalpuri. Bhairav is considered a fearsome manifestation of Shiva. He wears a garland of skulls and carries a club of peacock feathers. Kaal Bhairav, whose name, Kaal means both Death and Fate, in addition to meaning Black. He is the black one who has also assumed the duties of the God of Death in Kashi. Even Death, it is said, is afraid of Kaal Bhairava. Kaal Bhairav's temple today is one of the most intresting in Varanasi. Entering from the street , through a door guarded by Bhairava's mount, the dog, one finds a fine courtyard, in the center of which is the main shrine of Bhairava. Only the silver face of kaala bhairava, garlanded with flowers, is visible through the doorway of inner sanctum. The rest of Bhairava's image-said to be pot-bellied, seated upon a dog, holding a trident-is hidden behind a cloth drapery. For many centuries, this temple was a spiritual center in Kashi for the most severe of Shiva ascetics, the "Kapalis" or "Skull-Bearers," and their later descendants, the Gorakhnathis. Today, however, the temple is no longer the exclusive domain of such extremist yogis and is, rather patronized by ordinary householders for his protective blessings.This temple is popular and beloved among those who live under its influence in the surrounding Kotwalpuri section of the city.